A new Issue of Lo Squaderno review has been published. Into the Black Box edited it together with Cristina Mattiucci. The Issue could be freely read and downloaded here. Moreover we publish below the table of contents and the editorial we wrote. produce it, the specific forms of power that “create” mobility, the historical background leading to the actual scenario. to merge logistics and territory as a way to open up a partly unexplored research field. This is a research strategy to somehow “ground” mobility and exploring its concrete, tangible and material fashion, as a complex assemblage of bodies and technologies, infrastructures and power relations, economic and political dynamics. 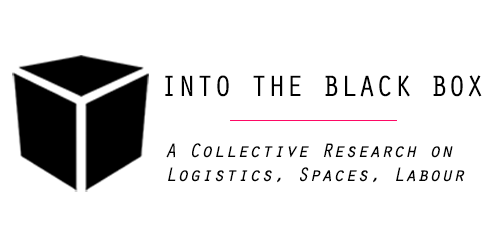 Exploring logistical territories is therefore proposed as a way for an overall re-orientation of the analytical and theoretical perspectives. lenses through which interpreting this emerging features of global dynamics. This issue then collects a sequence of “pictures” of this ongoing process of logistification of territories and of territorialisation of the global logistics, presenting a polyphonic discussion which takes logistics as a category that allows to stress the new layers that affect, warp and redraw the global spaces and the global plots that are passing through them. All the selected papers have been organized as framed in three following sections, which focus specific subtopics. 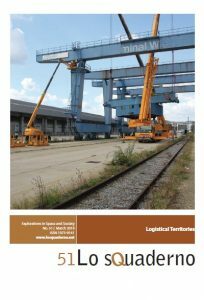 a discussion on the effect of logistical logics on a broader territory, pointing out the contradiction between the indigenous territorialization logics and the develop of Australian cities conceived as global logistics hubs, letting reflect about the accumulation by dispossession behind it and its unsustainability. into politicized territories aligned to a global power (with its respective corporate interests and their logistics networks). We are therefore confronted with a galaxy of airports, free-trade zones, logistics warehouses and data centres, port expansions and shipping canal upgrades, continent-spanning road, rail and fuel transport projects, that have all become hallmarks of an infrastructure-led attempt to secure competing national visions of capitalist growth. mode of production, and what this is producing in terms of interactions between ports and their surrounding territories; Hockenberry leads us to the liminal site of the products of global logistical assembly – exemplified by the space of the Shenzhen markets in southern China – presenting it as a logistical territory borne from an Orientalist imaginary deployed as a discursive construct promising an approach to the otherwise inaccessible landscape of global supply chains.